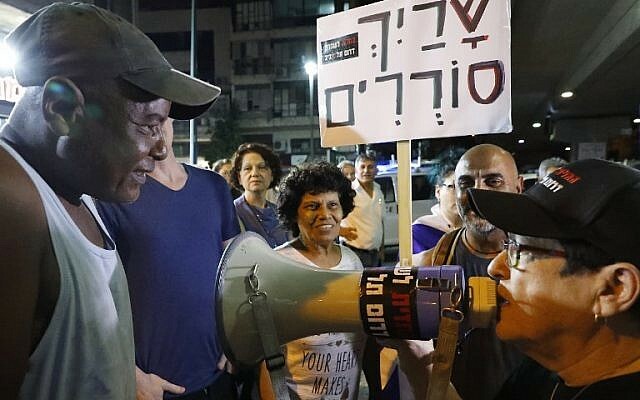 Attorney General Avichai Mandelblit on Friday ordered a probe into possible incitement after protesters burned photographs of Interior Minister Aryeh Deri during a demonstration against African migrants in south Tel Aviv a day earlier. Mandeblit notified Deri’s office Friday that a probe into events had been launched by state prosecutors. The burning of Deri’s image drew wall-to-wall condemnation Friday from politicians, including Prime Minister Benjamin Netanyahu. Some 300 people took part in the protest, expressing anger at the government’s seeming inability to remove tens of thousands of asylum seekers from the impoverished neighborhoods. 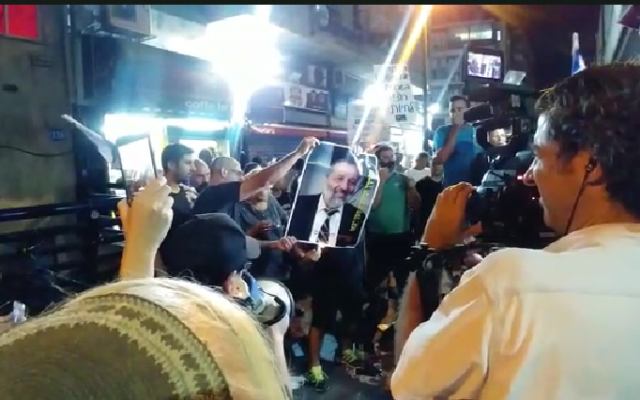 Deri, the minister responsible for overseeing the country’s refugee policy and who has taken a hard line and actively sought their deportations, was pilloried by the protesters and at least one picture of him was set on fire, drawing fierce anger from fellow politicians. South Tel Aviv residents, he said, had for years been living “in hellish conditions,” with rising crime and vandalism. 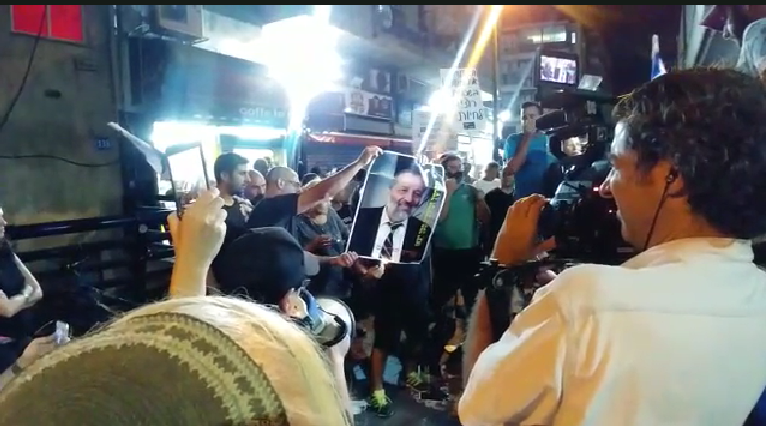 The burning of Deri’s photo, he said, was a “desperate” act aimed at “drawing attention” to the residents’ plight. Lawmakers called for a police investigation and warned of incitement to violence. 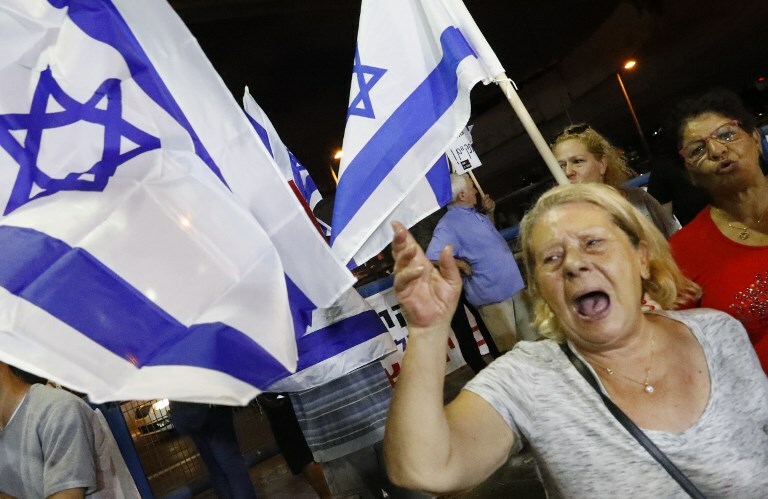 MK Yinon Azoulay, from Deri’s Shas Party, said demonstrators also called for Deri to be assaulted or murdered, and asked Mandelblit and Public Security Minister Gilad Erdan to open a probe. Another Shas MK, Michael Michaeli, called on Justice Minister Ayelet Shaked to open an investigation. “A red line has been crossed,” he said. Other lawmakers, all on the right, also condemned the display and came to Deri’s defense. 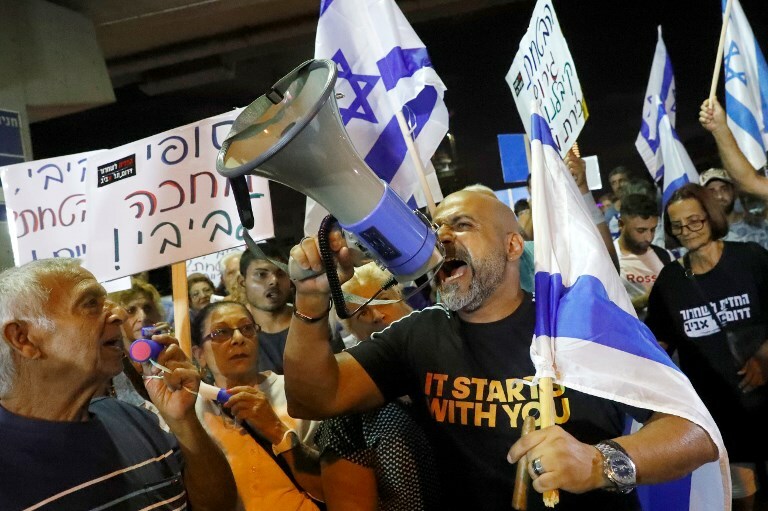 The protest against Deri “is unacceptable, illegitimate and deserving of every condemnation,” Tourism Minister Yariv Levin said. But he also added that protesters’ anger should be turned against the High Court, which has consistently torpedoed Deri’s plans to have the migrants deported. 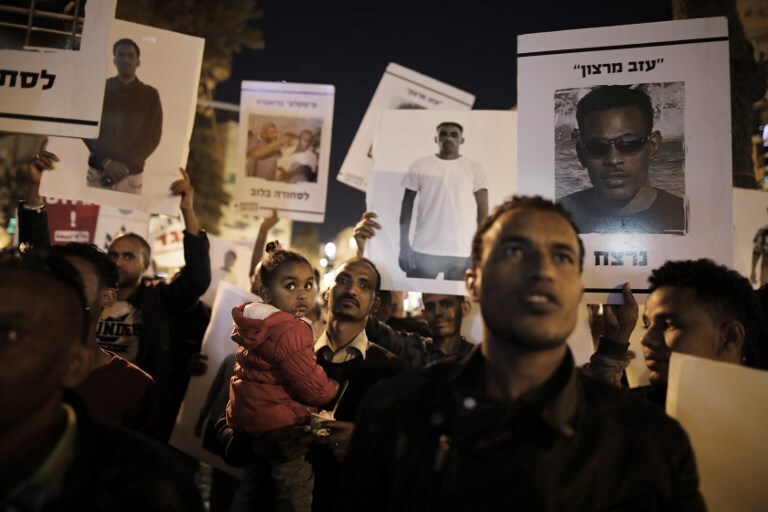 In recent years, the estimated 35,000 African migrants in Israel have been detained, threatened with deportation, and faced hostility from lawmakers and residents. The court has pushed back against government plans to jail or deport the migrants, saying a solution in line with international norms must be found. In April, Israel reached an agreement with the United Nations to have roughly half of the migrants resettled in Western countries, with others allowed to stay in Israel. But the government quickly scrapped the deal after an outcry by right-wing politicians and residents of the hardscrabble areas where many of the migrants live. The measures have kept the migrants living in limbo. The overwhelming majority have not been granted asylum and they lead a tenuous existence. 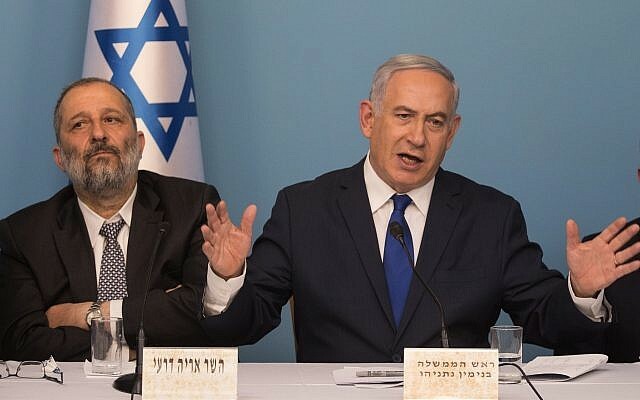 Deputy Finance Minister Yitzhak Cohen, also from Shas, blamed the same “bullies” who had forced the government to backtrack on that deal for now threatening Deri, whom he said had been uncompromising toward the migrants. “This bullying can lead to the shedding of blood,” he said. Environmental Protection Minister Ze’ev Elkin said he understood the protesters’ anger, but did not agree with the tactic. “Nothing justifies burning pictures of a public figure,” said Elkin, who is running for mayor of Jerusalem. 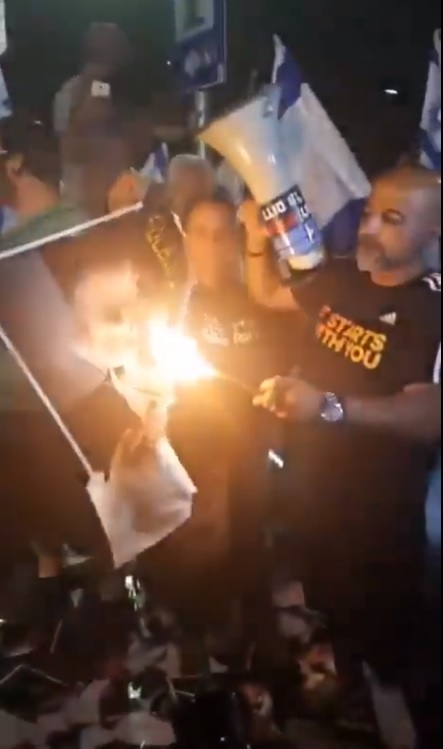 Protest leader Shefi Paz stood by the burning of the picture and denied anyone had called for violence against Deri or other government officials. “His people need to stop being crybabies,” she said, according to the Srugim website. During the protest, demonstrators railed against politicians, including those on the far-right who have publicly supported them in the past. Jewish Home MK Bezalel Smotrich visited the protest, but was driven off with angry shouts from the demonstrators. 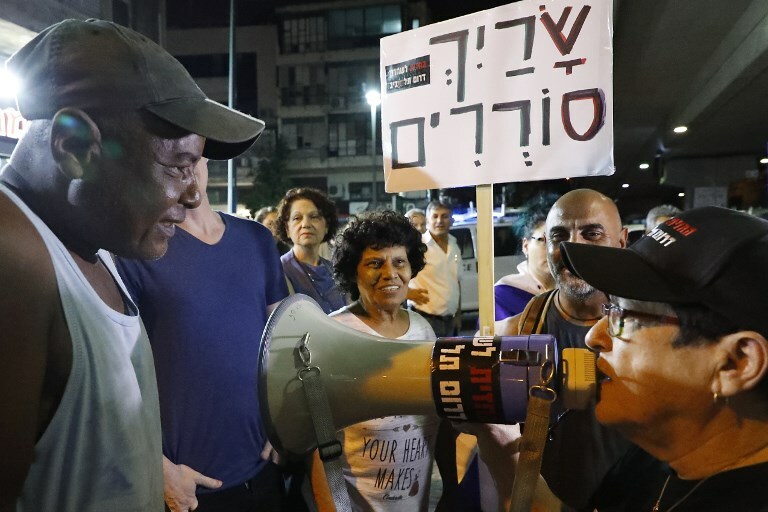 One protester held up a sign addressed to Prime Minister Benjamin Netanyahu that read, “Bibi, keep your promise.” Netanyahu visited the area last year and vowed to solve the problem, but no government framework has yet been put forward. The event was held on Levinsky Street, in the heart of an area many migrants have made their homes. 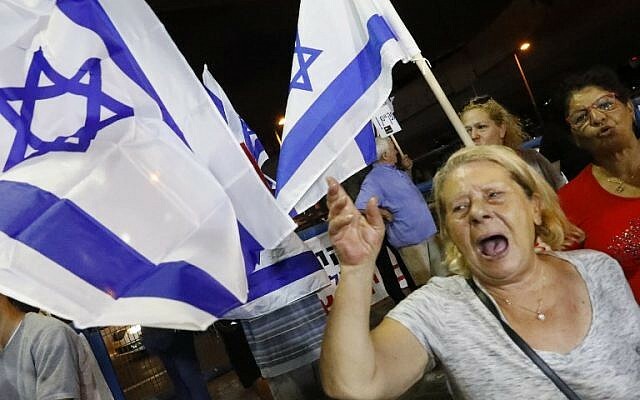 Israeli residents of the neighborhood complain that the asylum seekers have changed the character of the area and have led to an increase in crime. While the migrants say they are refugees fleeing conflict or persecution, Israel views them as job-seekers who threaten the Jewish character of the state. 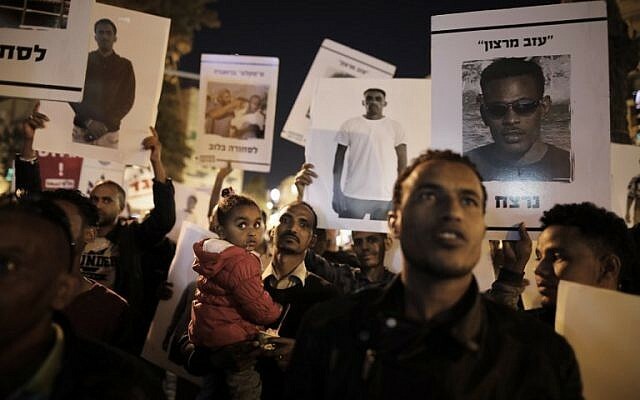 The Africans, mainly from war-torn Sudan and dictatorial Eritrea, began arriving in Israel in 2005 through its porous border with Egypt, after Egyptian forces violently quashed a refugee demonstration in Cairo and word spread of safety and job opportunities in Israel. Tens of thousands crossed the desert border, often after enduring dangerous journeys, before Israel completed a barrier in 2012 that stopped the influx. Since then, Israel has wrestled with how to cope with those already in the country. Many took up menial jobs in hotels and restaurants, and thousands settled in southern Tel Aviv, where Israeli residents began complaining of rising crime.